Campaign success - school saved! On Oct 5th the Steiner school group exchanged contracts with Cardiff Council, and the school is now theirs. Contractors will be working on site for the next few weeks and Steiner plan to open after Christmas. A big 'Thank you' to all who campaigned so hard to save this much loved building - turning up for site visits, planning committee meetings, LNRA meetings; put posters up in windows and wrote numerous letters to the Echo. We received support from ex-pupils and ex-Llandaff North residents now living in England and Australia too! It's been a long hard slog and residents' determination has won through! 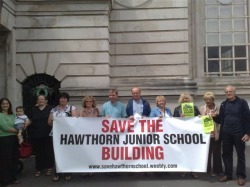 Residents may be aware that Cardiff council has announced that Hawthorn Junior school building is to be sold to the Steiner charity for use as a school. For these reasons, the campaign has put its celebrations on hold and will remain active until the sale goes ahead. We thank residents for their support so far, and ask that this be maintained until we have a more certain outcome. We are pleased to tell you that the council have announced that Hawthorn Junior school building is to be sold to the Steiner charity for use as a school! A big 'thank you' to all those residents who turned up to meetings, organised and signed our petitions, attend planning committee meetings, wrote letters to the Echo, made financial donations to the campaign, displayed campaign posters and the community who really pulled together to fight for this well loved building.Thanks also to the Echo for following the story. However, until the sale and Steiner school moves in, the campign and website will remain active. We will be responding in due course. Llandaff North resident Paul Rock wrote the following letter which was published in the Echo, 7th July 2011. 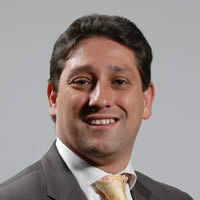 With regards to the future of the Hawthron Junior school buildings in Llandaff North, I note that Rodney berman wants to "find a suitable bid that would allow the building to be retained" ("Group wants option for school considered", Echo June 20). In view of the strength of local feeling and the views of the council's own planning committee, I'm sure Mr Berman wil be able to find a way to preserve this vital piece of heritage for generations to come. 5 Letters in the Echo! Four residents, past and present, and Julie Morgan AM, wrote to support the campaign against demolition, asking for the building to be saved. Although the campaign has been quiet up until recently, several residents have been working hard behind the scenes to save the building. In Dec 2010 the council invited expressions of interest (EOI) for the building. There were several 'bids', including one from a group of Llandaff North residents. Unfortunately this could not progress (see below). The council is currently talking to a developer who wants to tear down the building for housing. However we know of at least one organisation that has recently come forward, interested in buying the school for conversion. The organisation is arts based and would be hugely welcome in the area. The council though, is unwilling to talk to any parties outside of the 2010 EOI process, and our councillors Jackie Hooper and Ann Rowland James are not actively pursuing this option. We think the council should be considering all options for the benefit of the community, and our councillors should be pressing for this. The EOI document clearly stated that the bids were NOT legally binding, so as far as we are concerned, there is no reason why the Council can't talk to new groups interested in the school building. Cardiff Council: this building, our building, must be saved from demolition and you should exhaust every option open to you, and also actively consult with the local community. Decision imminent and new interest! The council undertook an 'expression of interest' (EOI) exercise at the end of 2010 and are currently in talks with a potential developer who wants to demolish the school for housing. We had a great response to our survey leaflet in February, so thanks to all who responded. The results were forwarded to our local councillors: over 95% wanted the building saved, preferably for community use. 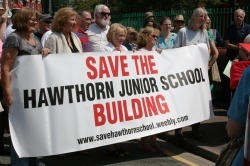 A group of residents submitted a bid (as part of the December 2010 EOI process) for the small section of the school for a community centre, but the council wouldn’t fund two community centres and the existing one on Hawthorn Rd East chose to remain in the current building rather than move across into what would become a new facility in the school. Therefore, the bid could progress no further, and we now have to continue the fight to save the building. Volunteers take a break for a photo! Visit www.LNRA.weebly.com Following residents’ complaints that the school was looking unkempt and falling into decline, we organised a volunteer clear up. Keep Wales Tidy’s 'Tidy Towns' officer, Chris Partridge, supervised and provided tools. Luckily the rain stayed away! Nine people turned up on Saturday 26th February 2011 to litter pick, pull up weeds etc and generally tidy up. Over 40 bags of rubbish and vegetation were collected! Approximately 50 residents attended the meeting last evening and overwhelmingly voted against demolition. It was also felt that once bids had been submitted to the council, the community should have a say in what scheme is chosen. We will be making enquiries as to how this can be achieved. It was also noted that it would be helpful for small groups who have an interest or are too small to bid on their own to come together to submit a bid.Visit the 'press articles' page for more detail. We've are holding an urgent public meeting at 7.00pm on Tuesday 16th November at Llandaff North community centre, Hawthorn Rd East. but should we not be successful, the council are still allowing the option to demolish the building. The meeting will discuss the issues, our campaign and our options. Residents and anyone interested in using this building for community use (either now or in the future) need to come forward and put together a viable plan. We need to put pressure on the council to keep this community asset. We also need to object to demolition, which the council is still allowing. Great News! Today the planning committee deferred its decision, asking for the applicant (Council) to revisit its application, taking into account the community's views and opposition to demolition. The committee were generally supportive of saving the building and the merits of doing so. The next stage is to work with our Llandaff North Councillors and engage with the Council in a positive and constructive manner to put forward an alternative to demolition. A big 'thank you' to Llandaff North residents, business' and elected representatives for your ongoing support- please continue through to the next stages. Also a big thank you to the planning committee for their time, attention and support so far. Diolch yn fawr! The planning committee made its site visit to the school. Over 40 residents from accross Llandaff North attended to show their opposition to the school's demolition! Thanks to all who attended, including Julie Morgan MP, Jonathan Morgan AM and Councillors Ann and Hooper. Over 14 of us (and a baby!) attended today's planning committee meeting at city hall, and are slowly learning how the process operates. The committee voted to make a site visit on 29th June. We will keep you posted. 09/06/09 Victorian Society supports us and calls for the building to be saved! Peter Kingsbury, Senior planning Officer, states the school buildings 'would probably lend themselves to conversion' in his submitted report. Click here to view. We will be responding to it at the meeting on the 10th June. We have sent a letter to the Chief Executive Byron Davies to complain about the lack of consultation; ask for the planning application to be withdrawn/deferred until consultation has taken place. Click here to view the letter. We have written to the Cllrs on the Planning Committee, to bring the matter to their attention and ask for their full and careful consideration of all matters raised by us. Click here to view. We have written to the South Wales Echo with details of our campaign. 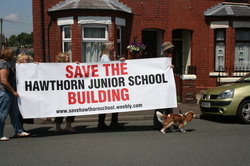 7/05/09Demonstration 7.30pm Thursday 7th May, Hawthorn Rd West School. Over 3o people attended on a wet evening, to show their oppostion the the building's demolision and to the way Cardiff Coiuncil has disposed of the site without any real consultation with the whole community. 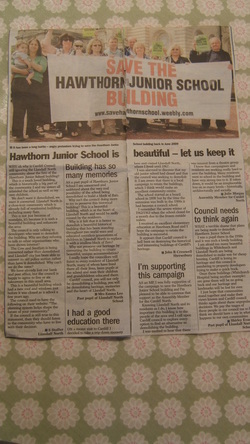 The event was covered by The Echo and we fully launched our campaign to save the biuilding. We will be meeting at 7.30pm at Llandaff North Community Centre to discuss developments and campiagn strategy, including electing an Action Group committee. 'Window posters' also available. We will be stepping up our campaign in the next few week so please come along. Due to the way the system works, the planning Officer has confirmed he will accept corresponance up to 22nd April. Note that the earlier he receives it, the more likely it will have due consideration. Over 40 residents attended for an update on issues and to agree a campaign stratergy. Residents will be kept informed via email and this website. Over 40 residents attended the meeting on 2nd April to save the school building. An overwhelming majority voted to keep the building intact, with most wanting to see the venue kept as a community facility. For notes of the meeting click on the icon below.